A 45yrs old man in Sagamu, Ogun State, Julius Ochim who lost his wife eight years ago has impregnated his own daughter. 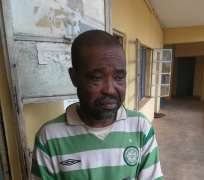 The man was arrested by men of Ogun State Police Command when the lady reported her father to the police. The lady revealed that her father has been sleeping with her since the demise of her mother. She explained that her father usually threaten her with cultural implication whenever she tried to refuse to allow her dad to sleep with her. The lady also told the police that her dad is the father of her 3-year-old daughter. Upon the receipt of the report, the DPO Shagamu Police Division, CSP Aduroja Moses led the detectives to the resident of the man where he was promptly arrested. On interrogation, the suspect confessed to the commission of the crime but blame it all on the devil’s handwork. He confessed to have been sleeping with the girl since the demise of his wife and that he started having problem with the girl when she started going out with another person whom she said she want to get married to. He confessed that the he was trying to prevent the girl from getting married so as to continue having his way with her. The Police Public Relations Officer for the Ogun State Police Command, Abimbola Oyeyemi confirmed to The Nigerian Voice. Oyeyemi said the Commissioner of Police in the state, Mr Ahmed Iliyasu has directed that the suspect be transferred to Anti-Human Trafficking and Child Labour Unit of State Criminal investigation and intelligence department for further investigation and prosecution of the suspect.